Massey Ferguson range of Telehandlers includes the following models : TH6030 (6m lift, 3000kg capacity), TH6534 (6.5m lift, 3,400kg capacity) TH7035 (7.0m lift, 3,500kg capacity) and the range topping TH7038 (7.0m lift, 3,800kg capacity. With two specifications having either 100hp or 130hp engines and either 100litres/min or 190liters/min hydraulics there will be a model of MF telehandler to suit your requirement. 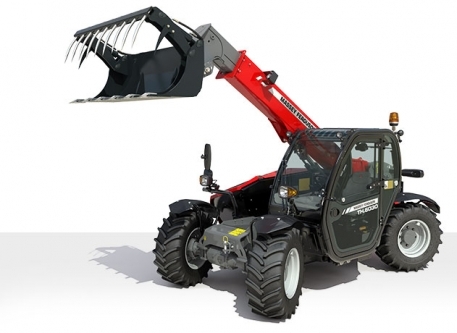 Every model in the new Massey Ferguson Telehandler line-up is impressive. With engine horsepower up to 130 hp, each one has the power and endurance to tackle the toughest jobs when you need it most. The MF TH Series is a serious performer that will prove to be invaluable around the farm. Speed, agility and strength are just some of the key benefits that make this the ideal multipurpose workmate in all kinds of farming operations. Handling jobs effortlessly and efficiently, the MF TH Series provides you with the optimum accessibility and manoeuvrability that you require. This range also gives you more lift height, a longer reach and the ability to lift heavier payloads. With the right attachment, the MF TH Series can achieve outstanding performance in a wide variety of applications around the farm. The new, slender chassis with a shorter overall length ensures stability and excellent manoeuvrability when you need it the most, as well as reassuring durability in the heaviest agricultural operations. A lower boom pivot allows unobstructed visibility around the entire machine, for safer, more productive operations. Optional boom suspension is available, which greatly increases operator comfort, for example, when towing a large trailer of straw at 40 km/h* during road transportation. All models have three selectable steering modes, two-wheel steer, four-wheel steer and crab-steer to provide optimum manoeuvrability in all operating conditions. Changing from one mode to another is very easy. Just pre-select the mode by pressing the switch in the cab and the mode will be engaged. The new, curved shape cab design, the new engine bonnet lower profile and the low boom pivot point ensures unsurpassed visibility all around the machine, especially from the rear of the cab whilst working in tight and narrow spaces. 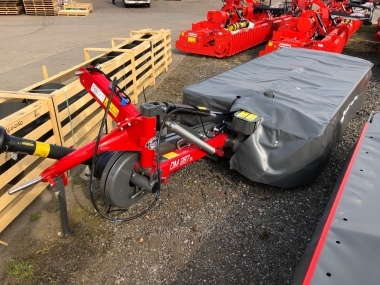 An unobstructed view of front attachments ensures safe and precise loading and unloading, making it easier and safer to position bales or pallets at elevated working heights. The new multifunction joystick is close to hand, ensuring efficiency, quick and easy operation and total productivity. A digital display screen located on the dashboard shows valuable information such as maximum speed and flow of hydraulics, job hours, vehicle or engine speed, boom angle, speed management and auxiliary hydraulics. The positioning of the joystick falls naturally to hand and incorporates all the main controls needed for operating the boom and attachments. The operator can activate a new eco mode by just the flick of a switch in the cabin. Oil flow and engine RPM are managed in order to reduce fuel consumption. A powerful and consistent hydraulic system is paramount to the everyday productivity of a telehandler. There is a loadsensing spool valve management system on all models. All functions are electro-hydraulic and proportional thanks to a load-sensing hydraulic system. It’s very accurate and easy to use, plus it allows the operator to simultaneously use three functions, increasing productivity and reducing downtime. The MF TH Series features a new 3.4l four-cylinder Tier 4 Final compliant Doosan engine which uses straightforward technology to give an environmentally friendly solution with no compromise. The engine delivers 100hp on the MF TH.6030 and MF TH.7035 and 130hp on the MF TH.6534 and MF TH.7038. Each of these models has a powerful and efficient engine, providing plenty of torque in applications that demand more traction and force. The larger and improved design of the engine cooling system ensures continuously high performance in demanding and confined operations. The engine is now mounted lengthways, not only does this ensure space for the boom to sit without impeding visibility when in the cab, but access to the engine area for servicing and maintenance is easy and straightforward. The two speed hydrostatic gearbox offers simplicity and smoothness of operation as well as high-performance output and capability. It has speed capabilities of up to 40 km/h* with two mechanical gears comprising of two speeds which allows the customer to choose the best speed for the application and gives excellent performance in road transport. It also has an easy-to-set creeper function for operations that demand low speed at higher engine revs. This feature provides more accuracy and control for operation such as sweeping, silage distribution, and straw spreading. Servicing is straightforward and simple thanks to well positioned service points, taking the stress out of maintaining your telehandler and leaving you with more time in the field/at work. Side opening of the bonnet gives you wide, open access to the engine, air filter, cooling system and air conditioning system; providing quick serviceability to all the major points. The air filter is removed easily for checking and cleaning. An optional automatic reverse fan is available if required. Just press the switch or set the automatic activation and the fan reverses its cycle, blowing out any dust, straw and other material that may become stuck to the cooling package. From ground level, you can easily lift the hood to check the engine and radiator. All routine engine, hydraulic and transmission service points are easily located for fast and simple maintenance, keeping downtime to a minimum. buy every original TH Telehandler Range part online.